Join the blue and gold carriages of the Venice-Simplon-Orient-Express in the beautiful city of Venice and spend overnight on board. The next day, enjoy the passing scenery as the train travels through Austria into Hungary, arriving in Budapest in the afternoon. 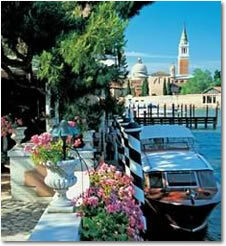 Board the legendary Venice-Simplon-Orient-Express in the beautiful city of Venice and spend overnight on board. The next day, enjoy the passing scenery as the train travels through Austria towards Hungary, arriving in Budapest mid-afternoon. Spend two nights in this fascinating city. Rejoin the train and continue your journey towards Paris. On departing Paris travel to the French coast for the Channel crossing. Board the gleaming carriages of the British Pullman for your journey through the Kentish countryside to your destination, London Victoria. Join the blue and gold carriages of the Venice-Simplon-Orient-Express in the beautiful city of Venice and spend overnight on board. The next day, enjoy the passing scenery as the train travels through Austria towards Hungary, arriving in Budapest mid-afternoon. Spend two nights in this fascinating city. On rejoining the train continue your journey arriving at your destination, Paris, the following morning. Embark on the blue and gold carriages of the Venice Simplon-Orient-Express in Venice and enjoy your day on board as the train travels through the beautiful scenery of the Italian Dolomites and the Swiss Alps. Spend overnight on board as the train travels through France towards Paris. On departing Paris travel to the French coast for the Channel crossing. Board the gleaming carriages of the British Pullman for your journey through the Kentish countryside to your destination, London Victoria. Embark on the blue and gold carriages of the Venice Simplon-Orient-Express in Venice and enjoy your day on board as the train travels through the beautiful scenery of the Italian Dolomites and the Swiss Alps. Spend overnight on board as the train travels through France, arriving in Paris Gare de L’Est in the morning. Join the blue and gold carriages of the Venice-Simplon-Orient-Express in the beautiful city of Venice for your journey to Prague. Spend overnight on board. The next day, enjoy the passing scenery as the train travels through Austria into the Czech Republic, arriving in Prague mid-afternoon. Join the blue and gold carriages of the Venice-Simplon-Orient-Express in the beautiful city of Venice and spend overnight on board. The next day, enjoy the passing scenery as the train travels through Austria into the Czech Republic, arriving in Prague mid-afternoon. Spend two nights in this fascinating city. On rejoining the train continue your journey through the Czech Republic and into Germany. Arrive the following morning at your destination, Paris. Depart from the beautiful city of Venice and spend overnight on board the Venice Simplon-Orient-Express. The next day, enjoy the passing scenery as the train travels through Austria into the Czech Republic, arriving in Prague mid-afternoon. Spend two nights in this fascinating city. On rejoining the train continue your journey through the Czech Republic and into Germany. After departing Paris the following morning travel to the French coast. After the Channel crossing board the gleaming carriages of the British Pullman for your journey through the Kentish countryside to your destination, London Victoria. The legendary Venice Simplon-Orient-Express awaits in the beautiful city of Venice for your overnight journey to Vienna. Arrive in Vienna in the morning. Spend the rest of your time in this beautiful city at your leisure. The legendary Venice Simplon-Orient-Express awaits in the beautiful city of Venice for your overnight journey to Vienna. Arrive in Vienna in the morning and spend two nights in this beautiful city. On rejoining the train continue your journey towards Paris. On departing Paris travel to the French coast for the Channel crossing. Board the gleaming carriages of the British Pullman for your journey through the Kentish countryside to your destination, London Victoria. Board the blue and gold carriages of the Venice Simplon-Orient-Express in Venice for your overnight journey to Vienna. Arrive in Vienna in the morning and spend two nights in this beautiful city. On rejoining the train continue your journey arriving at your destination, Paris, the following morning.